Are you ready for #EBA2019AM? 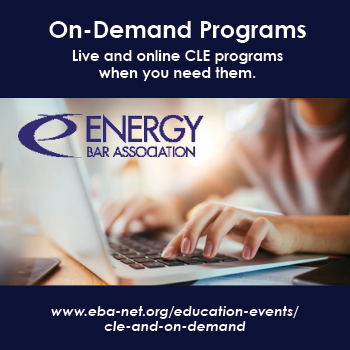 Don't miss your opportunity to obtain CLE and ethics credit, join timely discussions, hear from energy experts and thought leaders, as well as network with more than 500 industry professionals at the upcoming #EBA2019AM! Register today! EBA has pre-recorded programs for you to access 24/7. Some include CLE credits. Visit the library now! EBA is proud to recognize our GEMS sponsors. Learn more about EBA's sponsorship packages that offer year-round exposure and targeted marketing. Partnering with EBA, connects you to over 2,200 energy industry professionals throughout the U.S. Find out how EBA can help you elevate your status and maximize visibility as a leader in the energy industry. Join the Charitable Foundation of the Energy Bar Association’s 2019 Fundraising Gala, Empowering Education in Haiti, to be held on May 6, 2019 at the Renaissance Washington DC, immediately following the first day of the EBA Annual Meeting and Conference. What is the top reason you plan to attend the 2019 Annual Meeting?